Pete will be returning to the Edinburgh Festival in August 2019 with his brand new show and tickets are on sale now! Click HERE. Come and witness the first and possibly final performance of the Greatest Magical Double Act of All Time! Award-winning magician/comedian Pete Firman returns to Edfringe with a magic show like you’ve never seen before. As seen on ‘Tonight at the London Palladium’, The John Bishop Show’ and ‘The Sarah Millican Television Programme’. Every night he will be joined by a different special guest who has no previous conjuring experience. Together they will perform jaw-dropping magic without any rehearsal. Pete Firman is the UK’s leading comedian/magician and a TV regular. Recent appearances include ‘The Generation Game‘ (BBC1), ‘The Next Great Magician’ (ITV1), ‘Tonight at the London Palladium’ (ITV1), ‘Let’s Sing & Dance for Comic Relief’ (BBC1) and ‘Tommy Cooper Forever‘ (ITV1). Pete first graced our screens in Channel 5’s groundbreaking series ‘Monkey Magic’ and later starred in BBC1′s prime-time Saturday night series ‘The Magicians’. His unique blend of comedy and magic has seen him invited to perform on countless prime-time TV programmes, including ‘The John Bishop Show’ (BBC1), ‘The Sarah Millican Television Programme’ (BBC2), ‘The One Show‘ (BBC1), ‘This Morning‘ (ITV1), ‘Edinburgh Comedy Fest Live’ (BBC3) and ‘The Magic Show Story’ (ITV1) amongst many others. Pete also wrote ‘Tricks To Freak Out Your Friends’, a beginners magic book for the 21st century, which was so successful in the UK that it was also released in the USA and is about to go into i’s second print run. He has written numerous articles on magic for publications such as The Guardian, The Scotsman and Time Out London. Live performances have taken him all over the world and his one-man shows have entertained sell-out audiences for 10 years in a row at the Edinburgh Fringe and on several UK tours. He’s been invited to perform at Montreal’s prestigious ‘Just For Laughs‘ festival, Hollywood’s famous ‘Magic Castle’ and London’s home of mystery, ’The Magic Circle.’ Other UK theatre productions include ‘Champions of Magic’, ‘The All-Star Stand Up Tour’ and ‘Sandi Toksvig’s Christmas Cracker’. Pete Firman is at Pleasance Courtyard. 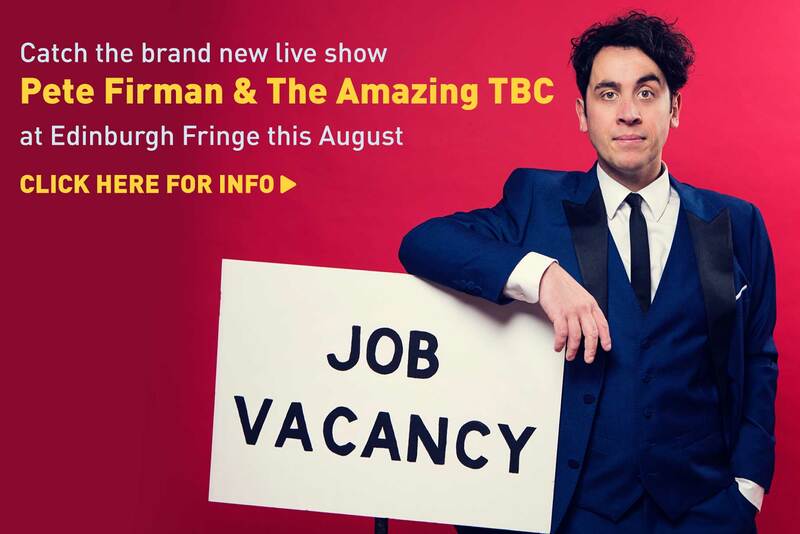 Here's the poster for my brand new live show, 'Pete Firman & The Amazing TBC'! It opens at the Edinburgh Festival in August and I cannot wait for you to see what I've got planned. Who's going to the Fringe this year? Pete is available for corporate and private engagements. From Claridges in London, to The Intercontinental Hotel in Hong Kong, Pete’s unique and engaging style has made him one of the most popular and in-demand performers in the corporate market. Pete’s after-dinner performances include world-class comedy magic and audience participation, which is very often tailored to the specific event. Pete’s act is a favourite amongst event organisers worldwide as it immediately engages, baffles and entertains in equal measure. The show can vary in length dependent on the client’s requirements and is guaranteed to leave audiences spellbound. He is also a highly experienced event and awards host, who effortlessly mixes humour, audience interaction and astonishing magic to keep clients delighted and guests thoroughly entertained. 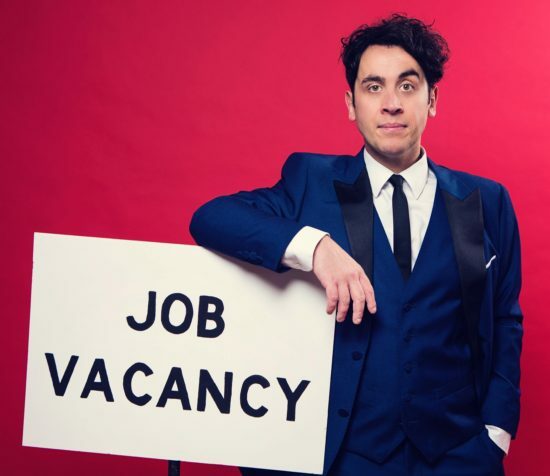 With over 15 years experience in creating and performing magic on television, Pete Firman has written, devised and consulted for every major broadcaster in the UK. He has also developed magical effects for several large scale theatre productions. As an expert on magic and it’s history, Pete has been called upon to write articles and speak on conjuring in mainstream media. His BBC Radio 4 documentary, ‘Pete Firman’s World of Magic’, aired to critical acclaim and he has given several interviews for television retrospectives, such as ITV1’s ‘The Magic Show Story’, Channel 4’s ’50 Greatest Magic Tricks’ and Channel Five’s ‘When Magic Tricks Go Horribly Wrong’. He was recently featured in a two-part ITV documentary on Tommy Cooper. Watch a clip here. Pete wrote ‘Tricks To Freak Out Your Friends’, a beginners magic book for the 21st century, which was so successful in the UK that it was also released in the USA and is about to go into it’s second print run. He has also written numerous articles on magic for publications such as Time Out London, The Scotsman and The Guardian. To enquire about magic consulting and advising, magic prop hire, writing and punditry, click here.